M83 debuts new music: "Do It, Try It"
Last week Richard Ashcroft debuted an uplifting new single "This Is How It Feels," from his forthcoming solo album These People. Ashcroft recently revealed to BBC Radio 6 host Steve Lamacq that the single is about resilience, and is intended to help lead people out of the darkness. "Instead of celebrating those dark moments and lead people into them, I want to give a feeling that leads them out through this madness, through that gap between the screen and reality and the real stuff, the human emotion." 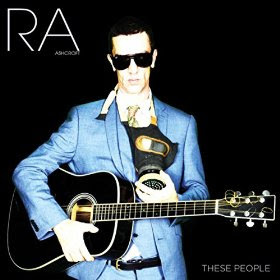 Ashcroft says he used a "palette of different instruments" to create These People and describes the album as full of "pretty powerful songs" that are "more of the timeless nature," yet still forge ahead into the future. "It's only the start I think, I've been away for a few years. I've done the odd gig but I'm really excited now and hungry to progress and hopefully take it to a great level where everyone's happy and can come and see me live and we can celebrate life." Today Ashcroft debuted the official video for "This Is How It Feels" which is available to stream below. These People is set for a May 20th release in the U.K. and Europe. So far a North American release hasn't been announced, but fans can pre-order the import through Amazon and Ashcroft's official store.